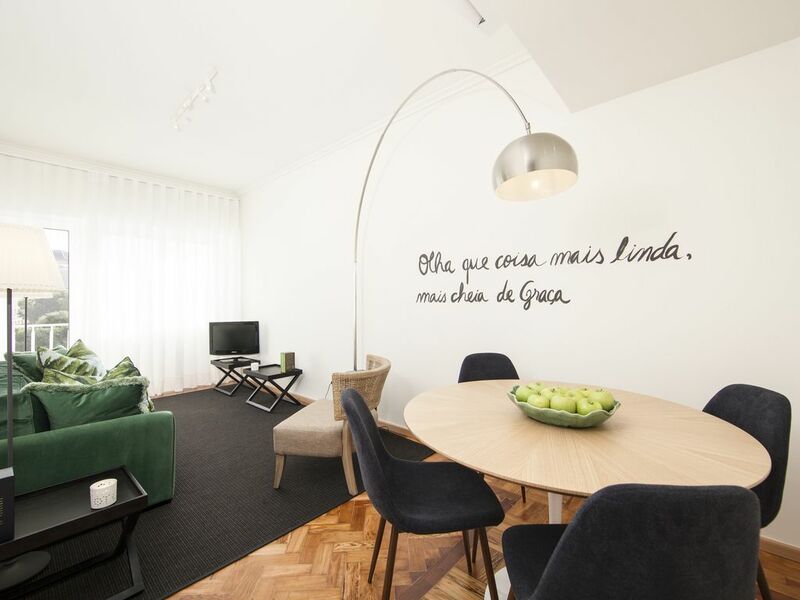 bwelcome graça lifestyle & culture apartment is inside one of the nicest neighborhoods of Lisbon. Graça is provided by plenty of restaurants, markets and transports, including the famous Tram 28. The apartment is located at Graça Square, close to Alfama and São Jorge Castle. It has two bedrooms, one living room, one kitchen and one bathroom. The balcony is facing Graça Square and River Tagus view. bwelcome graça lifestyle & culture apartment is on a 4th floor (lift) and it was fully renovated on May 2017. Full of sunlight and amazing views. Just in front of the building you can find a stop of the famous Tram 28. The apartment has a equipped kitchen (cooking plate, microwave, toaster, nespresso coffee machine, dish machine, fridge and freezer and all kitchenware), one bathroom (hair dryer), two bedrooms (both with air conditioning) and at the living room one table for four persons, cable TV, free WIFI internet and also air conditioning. Any assistance do not hesitate to call, email or whatsapp me. From the airport we advise to take a taxi (around 15€). If you are coming with car You may park on the street however you have to pay at the machines. •	Please leave the kitchen as well as all flat clean and tidy as you found it on arrival. Garbage: Please drop your garbage into the container placed at the building entrance. Garbage truck collect it every night (except Sunday). •	Check-Out – Until 11am. •	According to Portuguese Law all hosts (adults and children) must present a legal and valid identity on arrival (ID European citizens and Passport other countries citizens). •	Municipal Tourist Tax - Overnight Stays - 2€ / person / night: The tax on overnight stays is applied to guests over the age of thirteen, per person and per overnight stay, up to a maximum of 7 nights per stay. Thank you for choosing bwelcome graça lifestyle & culture apartment!!! Travel is my favourite hobby and for that reason I've decided to initiate this activity in order to be permanently in contact with other persons and cultures. I've prepared both apartements with passion and dedication to make you feel at home: bwelcome!!! Air conditioning, one table for four persons, cable TV, free Wi-Fi internet. Charming apartment in a great area! Highly recommend the bwelcome flat in graça! Cute restaurants abound in the square with public transportation just steps away. The bwelcome staff was great - especially sweet Felisberta! I wanted to bring her home with me. Lovely touches in the apartment such as a bottle of wine, the local pastry “nota”, and fresh fruit. Would definitely stay with bwelcome again! Beautiful, modern, clean, great views and a nice balcony. This is an incredible unit, very clean and the welcome we received was amazing. A round basket of apples, a bottle of wine, a box of the local specialty (pastis de nada) was waiting for us upon arrival, and the lovely woman greeting us was so helpful and informative. Each of the beds were very comfortable, and there was ample space to hang items and store our luggage. The bathroom was very spacious, and the shower was nice and large. The kitchen was very clean and everything was easily accessed. This is a great place to stay and many conveniences (restaurants, markets, a ticket office to name a few) were all readily seen and very easy to walk to. I highly recommend this place to anyone who wants to enjoy a nice, quiet and convenient place to stay in Lisbon. This property was excellent--immaculately clean, very comfortable and lots of thoughtful touches. It is ideally situated for exploring Lisbon, and there were shops nearby for self-catering, as well as good restaurants for eating out. The owners were very attentive and made us feel really welcome. Thank you to Francisco and Luis--I hope to come again. Thank you so much for your kind words! It was really a pleasure to welcome you at bwelcome graça lifestyle & culture apartment and we are happy to know that you have enjoyed your stay! We very much appreciate your comment and, of course, it is always a pleasure to receive a positive feedback as it is an encouragement to improve even more our quality and service. We will be happy to see you again! This is a wonderful 2/1 unit on the 4th floor, all new inside, with an elevator, everything including the A/C works flawlessly. It is hospital clean, and in the heart of Lisbon surrounded by great restaurants. Nest time I go to Lisbon, which I hope is soon. I'll be staying here. Municipal Tourist Tax - Overnight Stays: The tax on overnight stays is applied to guests over the age of thirteen, per person and per overnight stay, up to a maximum of 7 nights per stay.